Do you need to make the switch from Pirate Forms to WPForms? Our form importer tool makes it easy to move your current forms into WPForms so there’s no need to rebuild them from scratch. In this tutorial, we’ll discuss how to import forms from the Pirate Forms plugin to WPForms. Here at WPForms, we’re excited to announce that we’ve acquired Pirate Forms. You can read all the details in our announcement post. To make the transition to WPForms as smooth as possible, you can use our migration tool. This option will appear at the top of your WordPress dashboard. 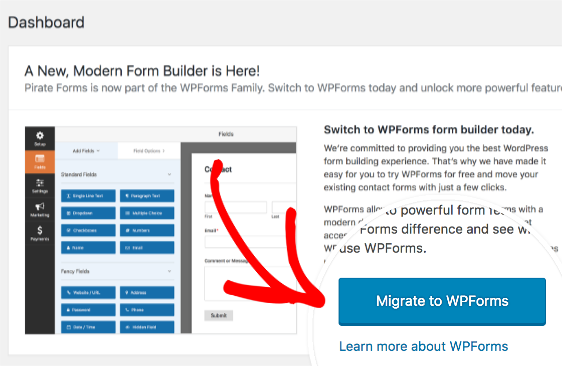 To begin the migration process, go ahead and click the Migrate to WPForms button. This will open the migration tool. 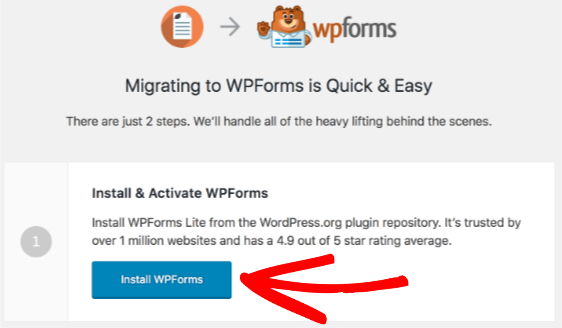 The first step is to install WPForms Lite, the free version of our plugin. You can do this easily by clicking the Install WPForms button. Note: If you’d like to consider upgrading to our paid version for even more features, you can find out more about our license features on our Pricing page. After clicking this button, WPForms Lite will automatically be installed and activated. Next, you can automatically import any forms from Pirate Forms. To do this, click the Start Migration button. If you have multiple forms in Pirate Forms, you’ll be able to choose which specific forms you’d like to import from the Available Forms column. Once selected, these forms will display in the Forms to Import column. 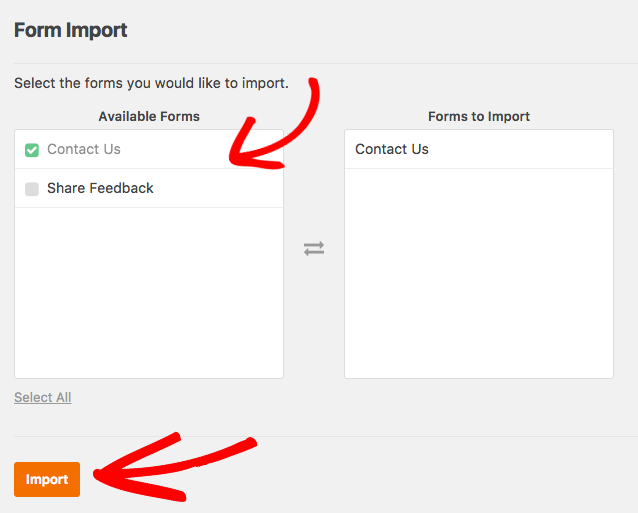 When you’ve selected all the forms you’d like to import, you can click the Import button. When the import has completed, you’ll see a success message as well as quick links to edit or preview any imported forms. 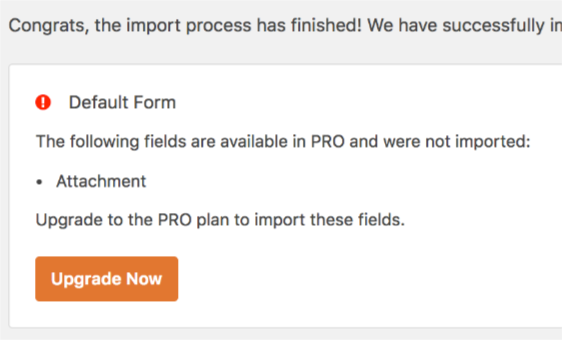 To make the import process as smooth as possible, the importer tool will let you know if any fields weren’t able to be imported due to compatibility issues. For example, certain fields may require a paid license to import. Once you’ve checked over your imported forms, you can use them to replace your previous forms. Note: Please always review and test your imported forms to be sure everything is set before using on a live page or post. To replace your old forms with WPForms, you’ll first need to open the page editor where an older form is embedded. From the editor, you can click the Add Form button. Next, you’ll be able to choose which form you’d like to add to the page, as well as whether you’d like to display it’s title and/or description. 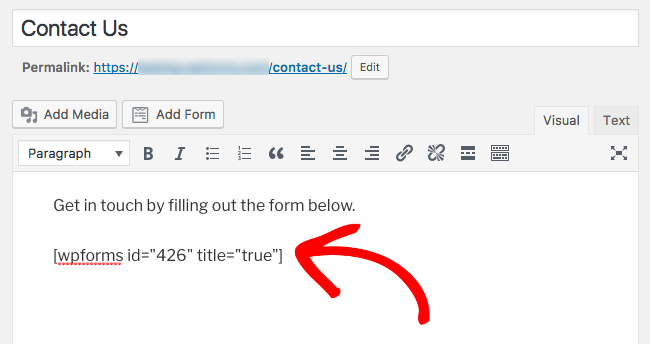 After clicking the Add Form button, you’ll see the WPForms shortcode added to your page editor. That’s it! 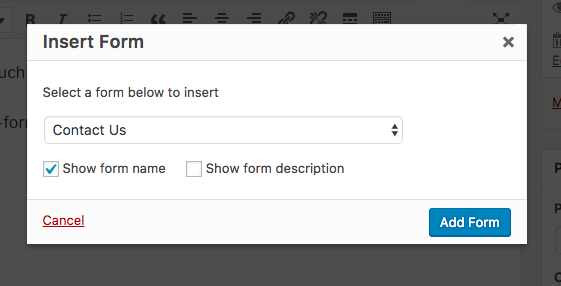 You’re now able to quickly bring in your forms from Pirate Forms to WPForms. Next, would you like to find out about entry management options available with a paid license for WPForms? Our guide to form entries discusses the many features WPForms offers for handling entries submitted to your forms.